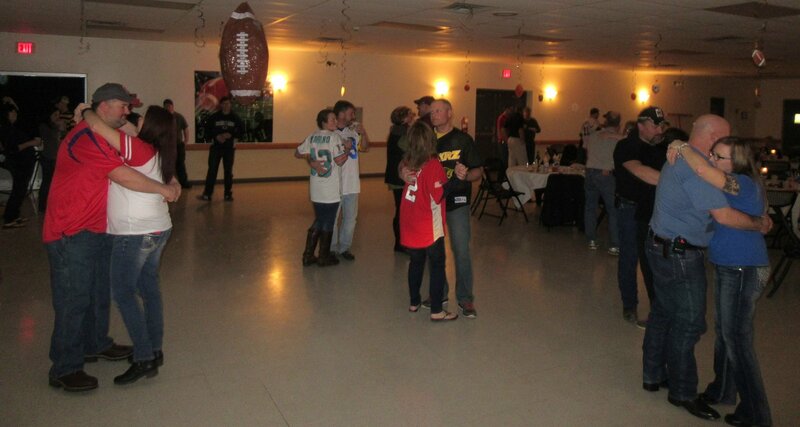 Dancing was just part of the annual celebration by members of the Triton Hose Company on Feb. 18. The event was arranged to recognize and award the company’s volunteers. 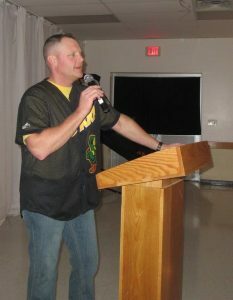 Company president Chuck Sands (above) provided opening and closing remarks for the brief program that followed dinner. 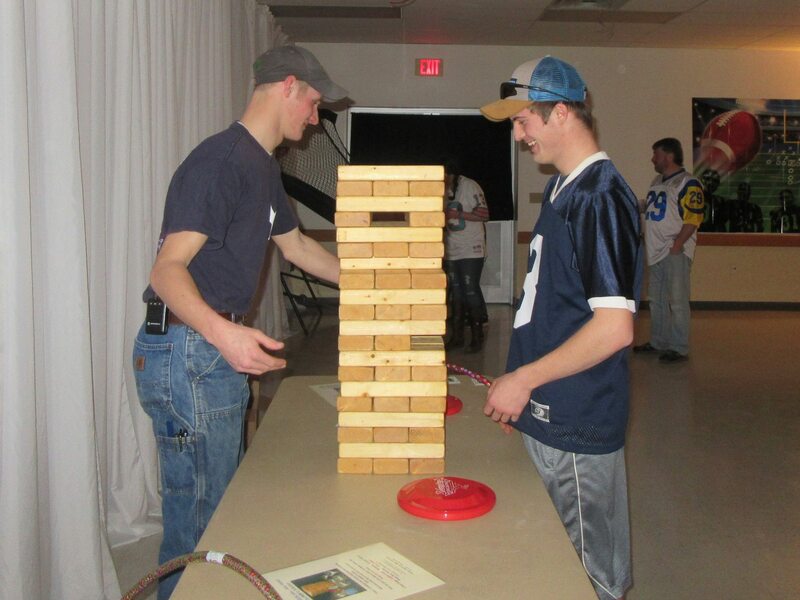 Approximately 90 people associated with the Triton Hose Company in Tunkhannock donned attire in honor of their favorite sports teams on Feb. 18 to enjoy food, beverages, games, karaoke, and dancing in the banquet room of the firehouse. The crowd was represented a combination of active, social, retired active, and life members. 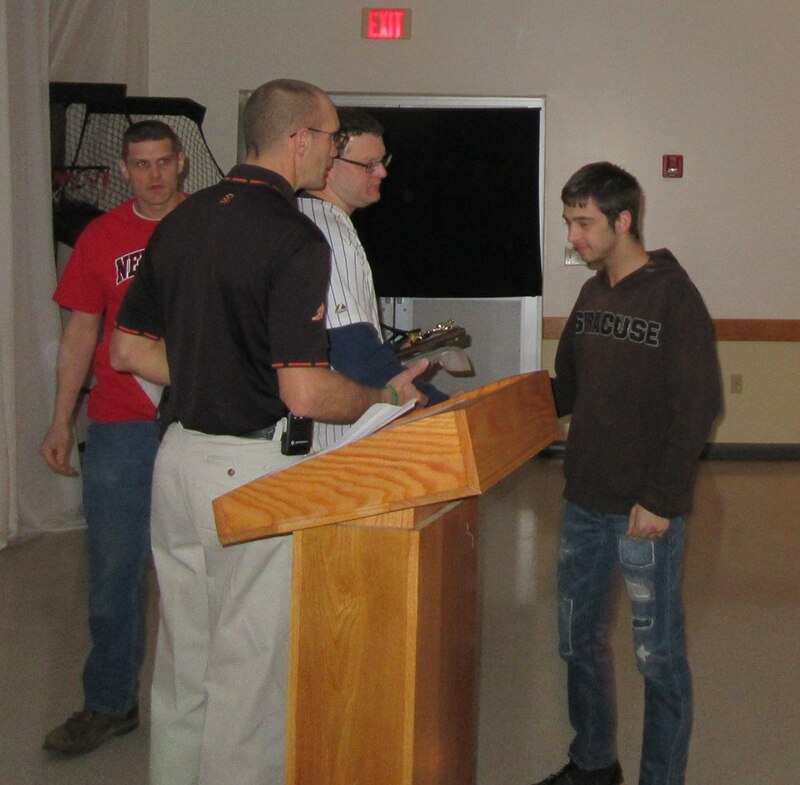 During the course of the “Triton Stomp,” it was the volunteers who were honored for their years of service to the department. The annual event featured decorations and games that fit a tailgate party theme, including a large partially deflated football that hung over the dance floor. A cocktail reception was followed by a sumptuous buffet served by Ma Greenley’s BBQ. 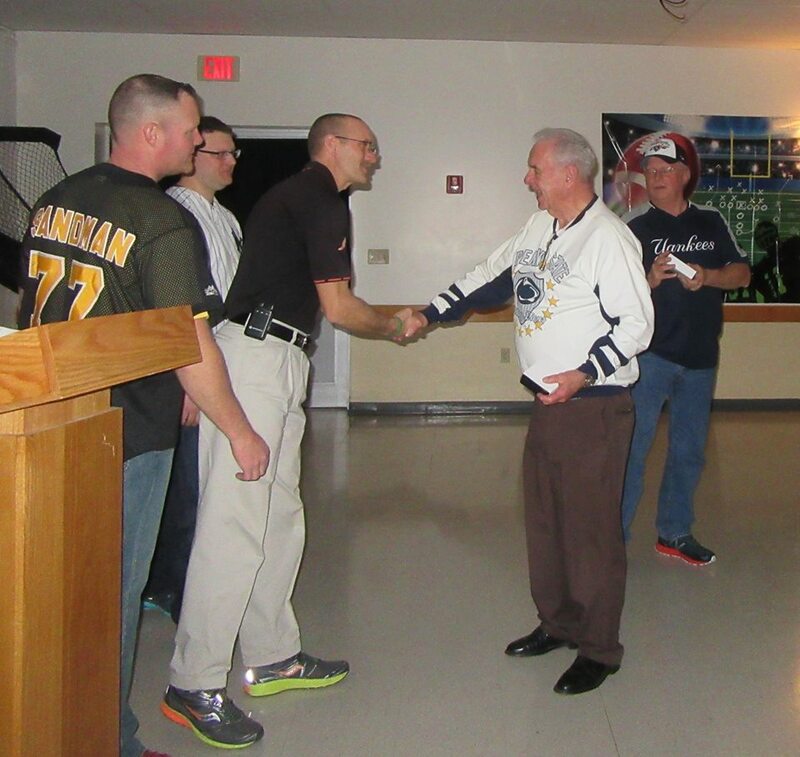 As the dinner hour wound down, Triton president Chuck Sands opened a program highlighted by a number of awards for firefighters and other volunteers that were distributed by Triton chief Randy Williams and officers Burt Dana and Eric Kukuchka. Sean Morrison (above, right) received an award for attending the most calls – 183 out of 289. 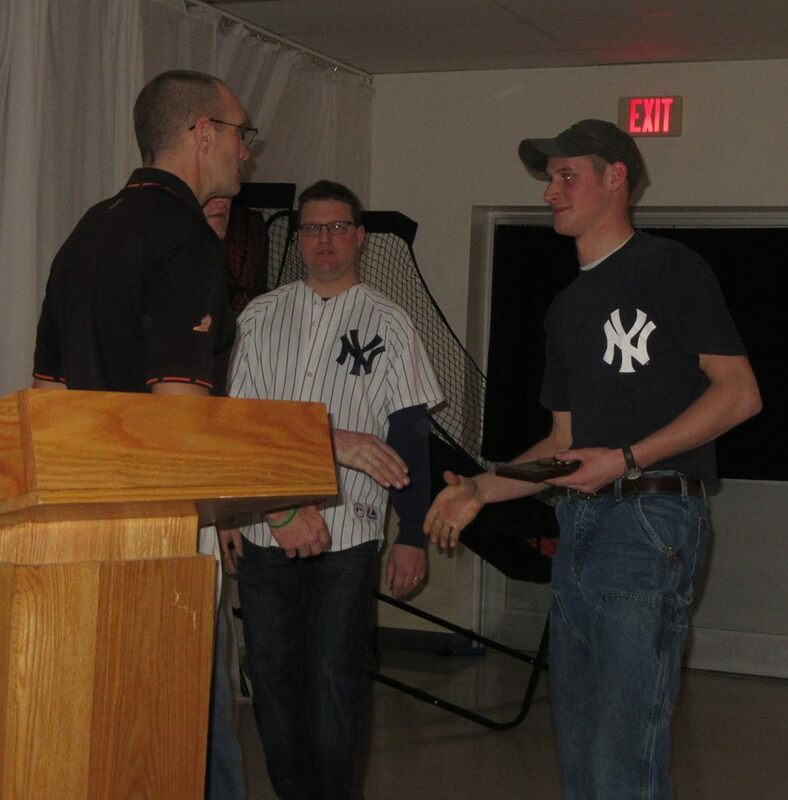 Junior Firefighter of the Year, who turned 18 in 2016 and is currently enrolled in the Firefighter 1 certification class with eight other members, was Alan Grow (below, left.) He participated in 98 calls during 2016. Life Membership Awards were presented to Bill Gaylord (below, right) and Bill Oliver (second from right), both logging more than 45 years of service to the company. White (below, left) presented the Chief’s Award to Darren Mahoney (right), whom he cited for the considerable amount of work he does behind the scenes, including keeping the fire engines cleaned, maintained and services. After the awards and the “roasting” of several members, Kukuchka also took time to honor Sands, who will be retiring from the Pennsylvania State Police force next month. 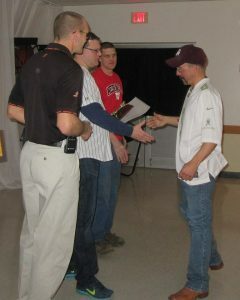 With formalities out of the way, fun ensued. 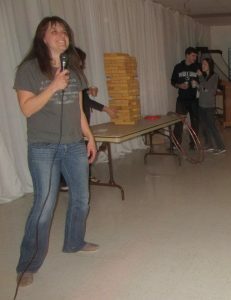 Revelers enjoyed Giant Jenga (above), hula hoops, karaoke (below), and dancing hosted by DJ Retro Rick, as well as an arcade basketball game. Meshoppen Fire Company covered the station for the evening to allow the Triton members to relax and enjoy each other’s company. To learn more about volunteer opportunities at the firehouse, follow Triton Hose Company on Facebook.